Hours of Operation: All Day. For my family, this attraction is a little beyond our time. With a soon to be 14 year old, bouncing in a Hunny Pot just isn’t at the top of her attraction list. However, that doesn’t mean that we don’t experience it for the nostalgia effect every now and again! Since this attraction is indoors, and features many of the scenes from the movie, it can be a great way to cool off from the blistering summer sun of Florida! It’s a slow moving ride, so there aren’t any fear factors based on that, and the gentle bouncing will probably excite all of the younger audience. One thing I like is the way part of the story is outlined in book form on the walls of the queue as you approach the ride vehicles, like the picture below. 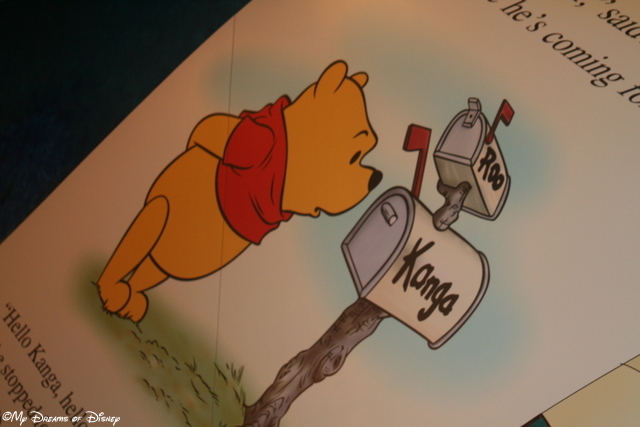 What is your take on this classic Disney tale? 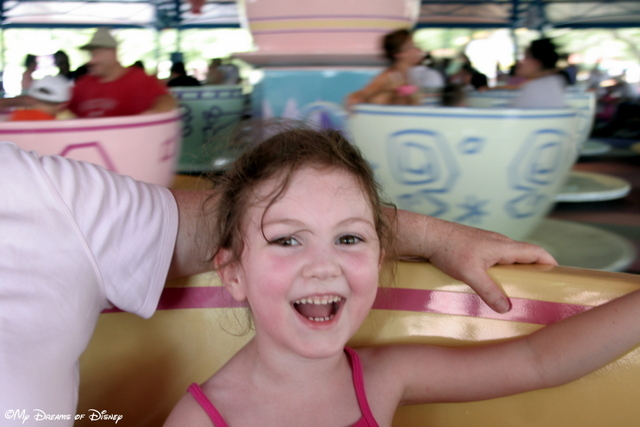 Do you ride it with your kids, do you wish Mr. Toad’s Wild Ride was back, or both? Let us know in our poll, and thanks! 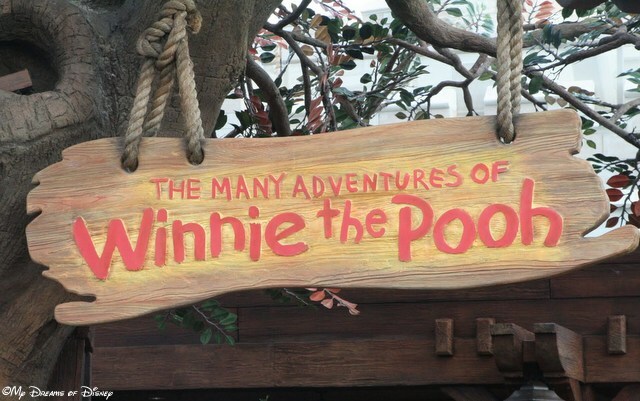 What do you think of the Many Adventures of Winnie the Pooh? The Mad Tea Party is an original day attraction at the Magic Kingdom, opening on October 1, 1971, although the name was originally called The Mad Hatters Mad Tea Party, but the premise is the same. The ride is based on the Unbirthday party scene in Alice in Wonderland, and as I’m sure you know, the tea cups can spin based on the center wheel in each tea cup. In Disneyland, the attraction was an opening day attraction as well, but one bit of trivia is that the tea cups had no braking system for the first two years, so there was no stopping you from spinning as fast as you could, except, of course, your ability and strength to do so! Do you like the Mad Tea Cups? Let me know, and thanks! 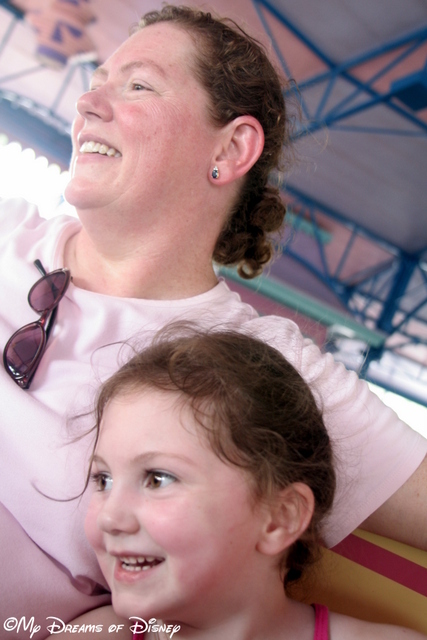 To conclude, have a look at this picture of Sophie and my wife Cindy on the attraction — a whole lot of joy, and that’s why kids love this attraction so much! Alice in Wonderland, Alice in Wonderland (Book and Charm), Alice's Adventures in Wonderland, Disneyland, Dumbo the Flying Elephant, Lewis Carroll, Mad Tea Party, Magic Kingdom, Main Street, The Walt Disney Company, U.S.A.